311 elephants died within the first 10 months of 2018 states the Wildlife Department as a result of the human-elephant conflict. It is also stated that 95 people had lost their lives due to the conflict. 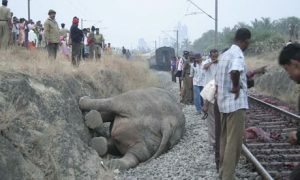 According to the statement, 48 elephants were killed due to gunshot wounds, 37 were electrocuted, 16 died in train accidents. 29 due to other accidents and 55 more died due to various human activities. 30 elephants too have died last year due to unidentified reasons.